Our jumbo square trampoline has an energetic bounce for active jumpers and large families. Whether it’s little kids learning their coordination, teenagers practicing moves and routines, or mom and dad getting fit, this trampoline is fun and beneficial for every member of the family! Every Springfree Trampoline is Smart. 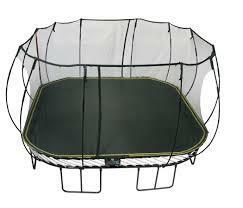 Add a tgoma game system to your purchase and turn your Springfree Trampoline into the ultimate interactive platform. Designed to motivate families to go outside and be active, tgoma includes learning games that teach math, language and problem solving. Featuring high-energy games and a fitness app that exercises both body and brain, your entire family will enjoy hours of outdoor fun! For trampolines purchased after January 1, 2017, full details of your product warranty can also be downloaded here. For trampolines purchased December 31, 2016 or prior, full details of your product warranty can also be downloaded here. DOUBLE your warranty by registering your Springfree Trampoline!